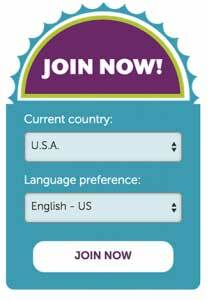 My friends often ask me why I joined Scentsy, so here I’m sharing my top 11 reasons to join Scentsy with me, Mary Gregory! 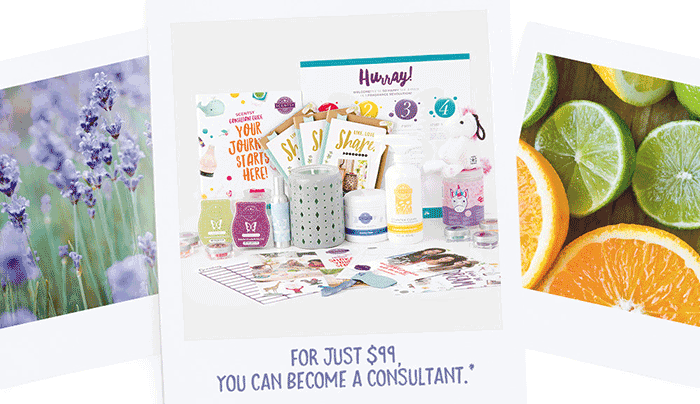 As a long time Scentsy Independent Director, I love my work as a consultant. Honestly, I can think of hundreds of reasons to join Scentsy, but for now I will give you 11 of them! Before reading the list I want to be completely transparent with you. Scentsy is NOT a get rich quick scheme. Just like any business, you will only be successful if you put in the work and keep with it for the long haul. I will say, the Scentsy leaders are honest and they truly care about their consultants. They are also darn good business people and really do have a wonderful marketing plan in place for all consultants. I sell Scentsy because I love safe fragrances and yes, I make some good money too. You can too, but only if you are willing to put in the work. You can be yourself! No fancy clothes or expensive cars needed – just your shining personality and enthusiasm for running your own operation. You can do this! No college, work experience or special schooling needed. Be part of something bigger than sales! Our team is a family, and we’re here to help support you and your business. The chance to give back! Scentsy believes in giving more than we take, and as consultants, we all have the opportunity to do the same. Earn additional income! * Earn income on a flexible schedule and connect the people you care about with products you believe in. Earn fabulous awards!† Consultants have earned incentive trips to places like Bali, Greece and Hawaii. Always smell good! Get paid to buy your favorite scents and enjoy the perks of a paycheck while having the best-smelling house on the block. The buck stops here! You are your own BOSS! You decide your work hours and how much you want to work. Get a professional Home Office team – free of charge! Scentsy is invested in you and committed to seeing your business be successful. Today is a new day! Don’t wait for a year from now to say, “I wish I would have signed up last year.” Start building your legacy now! Scentsy actually shared a list of just 10 reasons to join Scentsy but I wanted to share one more that is very special to me. Specifically because I am a Scentsy consultant, I have earned all expense paid vacations to locations all over the world! While doing so my husband and I have made friends with some of the most amazing people, ever! Some of these friends have become so very special and if not for Scentsy, we would have never had the pleasure meeting them. *Consultants earn 20 percent on the first 1,000 points in Personal Retail Volume (PRV) and 25 percent on all sales after that, plus up to 9 percent bonus on PRV based on rank and a 5 percent bonus when monthly sales exceed 2,000 points in PRV. You may also earn leadership bonuses based on downline sales. 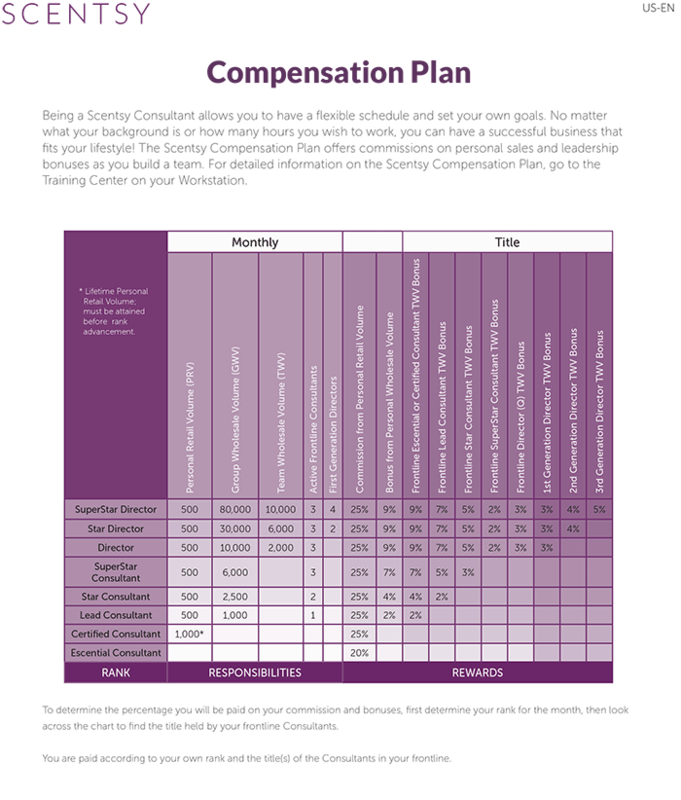 Scroll down for a detailed look at Scentsy’s compensation plan. Example of What’s Included in the New Consultant Start Up Kit. Contents Vary! As you can see in the chart below, the top earners are the Super Star Directors. Then comes the Star Directors and after that, the Directors. You can earn as little or as much as you like, but just like any other business, to be a top earner it will take lots of hard work. There is NO magic secret to being successful. I will say, I really enjoy and have tons of fun as a consultant. I’ve been passionate about home fragrances my entire life and as a result, being a consultant is not like work for me. Some months I’ve made some very good money and others, not so much. I’ve earned ALL EXPENSE PAID VACATIONS to Punta Cana, New York City and other locations. Regardless, I recommend joining Scentsy to my own family members, but I’m very clear about how their success is directly related to the amount of work they’re willing to put into it.